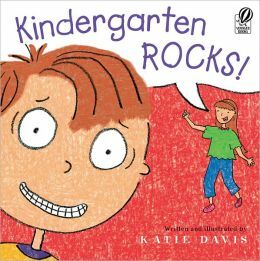 Katie Davis is one of the contributing author/illustrators for this month’s Picture Book Idea Month blog posts, (her post will be up on Sunday, November 10th) so I’m highlighting one of her books to complement my blog post about PiBoIdMo last Monday. She also hosts monthly podcasts about kidlit, Brain Burps About Books, and has a host of other resources and learning opportunities on her website, katiedavis.com. Education.com has tons of kindergarten activities and crafts to make learning FUN! Remembering back, my kids were fine, but I was a mess that first day! Of course, they might just have been better at hiding it. 🙂 Love this book. I love the trailer and the fact that Rufus is the one who is afraid. Great choice, Beth! That sounds great for kindergarteners! Great idea, Katie. I love the idea behind the book and the transfer of feelings/fears to the stuffed animal. Absolutely love the video — great idea to have kids talking about their first day! The video rocks too! Great choice! I’ve haven’t had the chance to look at one of Katie’s books. . .thanks for sharing this one, Beth! Kindergarten DOES rock!! What a great book! I can’t wait to find this one. I spend a lot of my time helping kids not be worried about kindergarten. That 1st week of school can be pretty tough for some kids! I love Katie, but blush to say I haven’t actually read this one. Thanks for the thorough review. I’d better get over to the library! Sounds just perfect for an about-to-be kindergartner! Thanks for adding it to our list, Beth!